This stunning space wallpaper is a combination of two composite images of NGC 6210. This stunning space wallpaper is a combination of two composite images of NGC 6210. The outer, mostly green portion represents the light of doubly ionized oxygen. 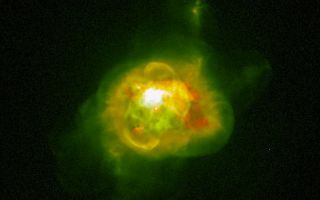 The inner portion represents the light of singly and doubly ionized oxygen in red and green respectively.